The real thing: Cover for the “Greatest Hits” US edition! To be released on July 26 – the same date as “Charm School” in the USA. See our previous entries about this subject below this post! Meanwhile our reader Majdy informs about new articles in American media here and there. @joy-rider: I do agree about the spacing but there’s always something… Overall it’s quite nice. I like the pic! The photo is ok, but way too OLD. The font used, kinda generic. But the worst thing about this release is not the design but the ridiculous tracklisting, it should have been more comprehensive. It makes it look like nothing happened between the “Joyride” album and “Wish I Could Fly”. I know the in-between singles didn’t make a big impact in the US chart, but this compilation offers a distorted image of Roxette’s whole career. Having “Sleeping In My Car” on it woudn’t hurt anyone (it was #50 in the US, not bad at all). 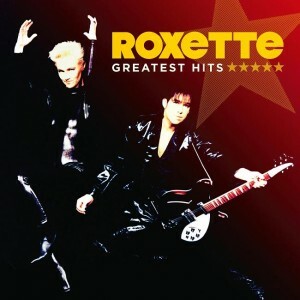 the new single by roxette, is in the us airplay radio for promotion or not? Yes it is! Was sent out 1 or 2 weeks ago AFAIK. Really? On your common channels or did you look for rox-friendly sources? So far I only heard the new song on Sirius XM Satellite radio, a channel called 20 0n 20 (they play it several times per day) and another channel called BPM (they played the Rickfors remix on this one). I don’t know about the “regular” radio, though some of my friends said they heard a lot of Roxette on radio lately (but only their old hits). Of course, Per’s Nordic Rox played Rox quite a lot, but that doesn’t count.